No-Bake very quick and easy Coconut & Lemon Bars, perfect for snacking! 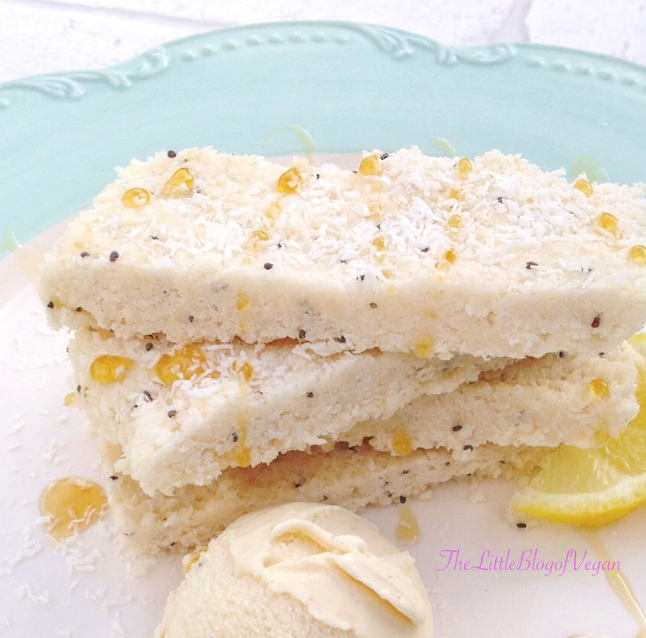 Lemon, in my opinion goes really well with Coconut so i threw them together and made these moorish Snack bars! These Bars are super quick and easy to make so why not give the a try, they're worth it! You can add some Dairy-free White Chocolate or Chia Seeds like i did, for added Protein! Step 1- Combine all of the lovely Ingredients into a Large Mixing Bowl or Food Prosessor/Blender (Its much easier to lightly Mix the Ingredients together then transfer it into a Food Processor. Step 3- When everything is combined,pop the Mix into a Tray or Container and Press down, making sure its all together. Step 4- Pop into the Freezer for 20 minutes before Cutting into Bar sizes and tuck in! Make it even better with some Soya Cream, a dollop of Dairy-free Ice-cream (mine is Swedish Glace Smooth Vanilla Dairy-free,Lactose-free & Gluten-free Ice-cream) and a Drizzle of Maple syrup for a real Sweet Treat! I hope you liked this recipe!